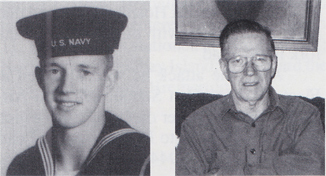 Leslie E. Salminen, E-3, born June 20, 1925, Chatham, MI, attended high school then joined the USN in August 1943. Military stations were Great Lakes, IL, and aboard the USS West Virginia. Memorable experiences include surviving a kamikaze attack. The bomb did not go off and the plane went through two decks. He was discharged in January 1946. He is married and has four children and 11 grandchildren. Employment: Logistics Department of GMC. He enjoys bowling, hunting and fishing.